Thelma B. Willingham was born and raised in Washington, D.C., and in her 20s, moved to upstate New York where she met her husband Marion, a native of Albany. In 2009, she and her husband moved to Four Seasons in Beaumont, where they had bought a house in 2007. At that time, they were living in Gaithersburg, Maryland. When they moved to California it was thanks to the encouragement of their grandchildren, one of whom was attending Loma Linda University. Since then, Thelma and Marion have enjoyed getting involved in the community as well as the weather! They also appreciate spending time with their grandkids and three great grand children. 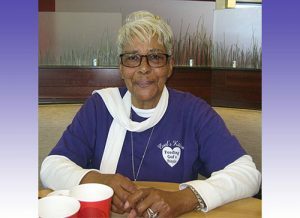 We had a chance to chat with Thelma this week. I have a friend who lives in Sun Lakes and Carol’s Kitchen was delivering food to her. She asked why don’t I try it. She gave me Ms. (Mary) O’Hara’s number who told me to come to the Banning kitchen on a Tuesday and that’s when I got started. That was the 15th anniversary year (2013). I think I started in February before we had the parade. What role do you serve at Carol’s Kitchen? Right now, I help manage the kitchen with Cathy. If they want me in the kitchen, I work in the kitchen. I used to cut up all the pies and cakes. At the time I started, there were flies that would come into the kitchen so I offered to cover up the cakes and pies so the flies wouldn’t get in them. Everybody thought that was very nice so that was my job. Now, I do everything. If the floor needs sweeping, I sweep the floor. Whatever’s needed. I like everything to look nice and everything has a place. I like to give back to the community. I enjoy helping people. I’ve always volunteered. My first volunteer job was at Walter Reed Hospital. I also volunteered with the Red Cross when I was young. I went to cosmetology school and we used to volunteer doing children’s hair. I was an Eastern Star sister and we helped with Meals on Wheels. When I was in New York, I also volunteered with Queens General Hospital on the medical floor, which I did for about 15 years. At that time, my husband was a police officer or detective for the NYPD so I wanted something to do at night, especially something where I could help others. I am also the director of my community center. I am a 7th Day Adventist and have been there for four years; there we give out clothes and food. Recently, I received a plaque from San Gorgonio Memorial Hospital where, on Sundays, I’m also a chaplain. My husband and I volunteer there all the time. I’m always amazed by how kind and generous people are and how we work as a team. Last week, we weren’t able to attend the kitchen and I realized how much I missed everyone. Carol’s Kitchen is feeding God’s people and really that is why we are there. That is the important thing.